Review: When a folklore professor becomes possessed by ancient Japanese demons it's up to Hellboy (voiced by Ron Perlman), Liz Sherman (voiced by Selma Blair), and Abe Sapien (voiced by Doug Jones) to travel to the Land of the Rising Sun and fight the sinister specters. After Guillermo del Toro's Hellboy was released in 2004, two animated features were produced, Hellboy Animated: Sword of Storms being the first. It's great to see the Big Red Guy battle supernatural monsters, demons, and creatures again, but this version seems to lack style, story, and character development. It's like an extra long episode of a Saturday morning cartoon version of Hellboy. It's not really dark, macabre, or gritty like the comics or film adaptations. And the animation style really doesn't help with that either. The best part is having the actors from del Toro's films back to keep the continuity going, but they really don't have much to do. The story is not very compelling, except for when Hellboy finds a cursed samurai sword which sends him to a supernatural dimension filled with ghosts, monsters, and vengeful villains. It's like if Hellboy was a Ronin traveling the haunted Japanese country-side dispatching any enemies that crossed his path. If it was only as exciting as it sounds. 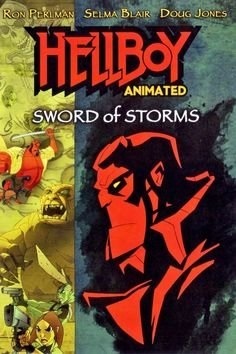 I really wanted to love Hellboy Animated: Sword of Storms, but it was a bit of a disappointment. I have yet to watch Hellboy Animated: Blood + Iron, and I'll share my thoughts on that one as well. Fun Fact: David Hyde Pierce was offered the chance to reprise his role as the voice of Abe Sapien. But Pierce felt that Doug Jones' voice should have been used in Hellboy (2004) and he turned it down so that Jones would get the role.